WHAT IS HC1709P? This PoE Swtich provides power and data from a single point, using Power over Ethernet over a single Cat-5 cable, HC1709P can be used for any 10/100Mbps link and supply industry-standard IEEE802.3af/at power. Advanced auto-sensing algorithm gives power up to 30 Watts for the end devices. APLLICATION: This PoE Switch is ideal for powering PoE devices such as Smart Home, IP cameras, WLAN access points, IP phones, office access control systerm, Time&attendance and other PD devices. NOTE: The total power of HC1709P is 65 Watts. Kindly check the total power of the front-end access devices before you connecting them. If they are overload, this smart switch will shut down the lastest access devices automatically and the LED indicators will be flash. If you need high power, you can choose our HC1709PE. Thank you. SERVICE: All products sold by Huacomm come with a 100% Satisfaction Guarantee. Huacomm will provide 24/7 Technical Support and LIMITED LIFETIME WARRANTY. We offer a 30-day money-back guarantee, as well as a 1 year warranty that covers replacement for free. System: Power, PoE Maximum Power; Every port: Link, Activity, Speed, Error. Operating Humidity: 90% max relative humidity, non-condensing. For more details, please refer to "Huacomm Profile"->"Help". 8-Port 10/100Mbps Desktop POE Switch plus one 10/100Mbps uplink port. Supports PoE power up to 30W for each PoE port, Supports PoE power up to 65W for all PoE ports, full IEEE802.3af/at standard compliant. LED indicators for monitoring power, link, activity. Security&Reliable. Smart PoE Power Supply, automatically identification, never destroy the front equipment. One-by-one port start function, avoid devices breakdown caused by surges or high loads. VLan functin, to prevent the invasion of network storm. 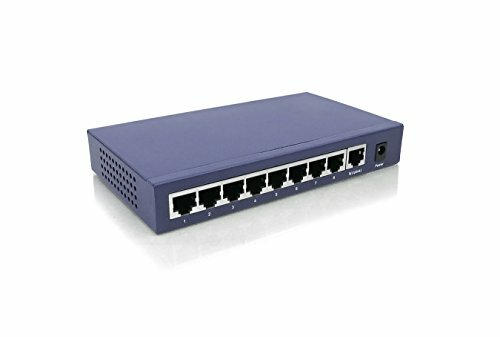 This PoE switch is ideal for powering PoE devices such as IP cameras, WLAN access points, IP phones, offices, office access control systems, and other PD devices and offers a line of high quality products that provide a total solution for Ethernet application in different environments. LIMITED LIFETIME WARRANTY and 24/7 Technical Support. Manufacturer: Huacomm Intelligent Technology Co., Ltd. Publisher: Huacomm Intelligent Technology Co., Ltd. Studio: Huacomm Intelligent Technology Co., Ltd. If you have any questions about this product by Huacomm, contact us by completing and submitting the form below. If you are looking for a specif part number, please include it with your message.